Munn Enterprises in Hattiesburg was one of 86 sign companies across the United States and Canada to observe Sign Manufacturing Day on Oct. 5. The company welcomed community guests along with educators and students from Covington County School District, Hattiesburg High School, Jones College, Lamar County School District, Pearl River Community College, and the University of Southern Mississippi. 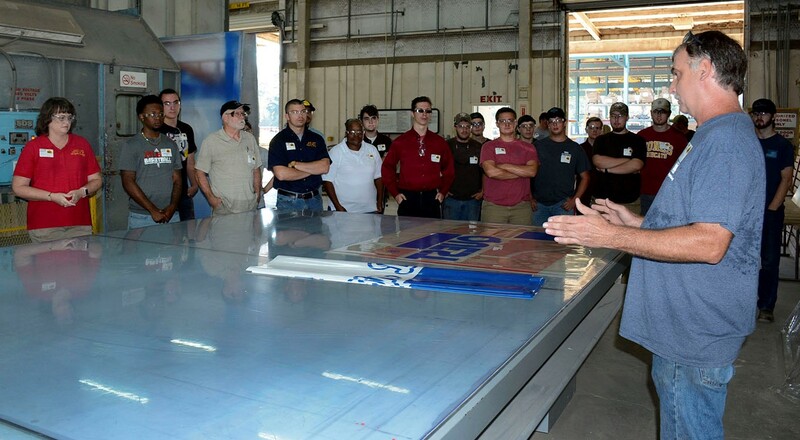 Guests toured the company’s office and production facility, watched a presentation on the company’s history and current work, viewed product and equipment demonstrations, and learned about the many available careers in sign manufacturing. Wilson said the goal of the event was to show students the viability of careers in manufacturing. During the tour, students were able to see the real-world uses of their education. 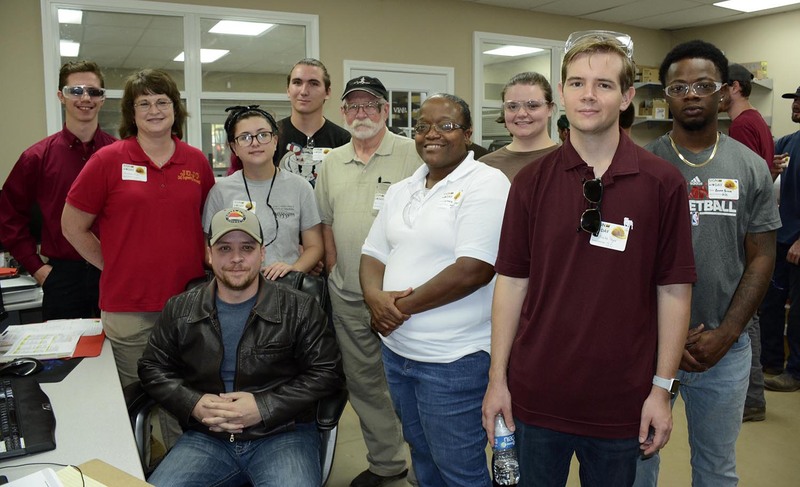 Students from Jones College’s drafting and design technology program, taught by Karen Kirk, stopped by and visited with the company’s draftsman, Nicholas Underwood, a graduate of the program. Underwood showed guests some of the detailed technical drawings he does through AutoCAD on a daily basis. Another popular stop on the tour was in the fabrication department, where experienced welders assemble the metal structures used in signage. Clyde Ward, one of the company’s welders, showed students how he and his fellow welders take Underwood’s drawings and translate them into products. This stop was of particular interest to Jason Pitts, welding instructor at Pearl River Community College, and his group of welding and cutting students. Other stops included the lettering and paint departments. Shannon Calder in lettering demonstrated the Accu-Bend channel letter bending machine, which uses hydraulic power to quickly bend aluminum into font styles and various shapes. 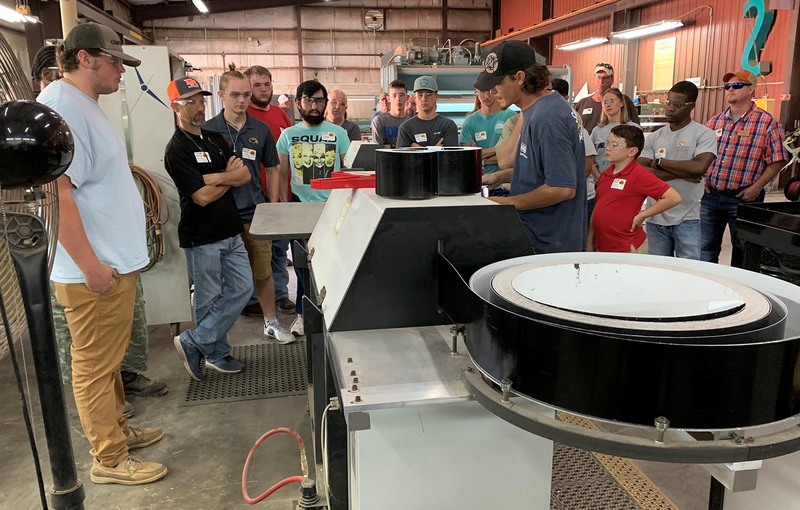 Terry Bolin, foreman in the paint department, showed guests the ROLLSROLLER flatbed applicator, used to finish products, and the two paint bays. A total of 157 guests, including more than 100 students, attended the event, said Wilson. “This was our first year to host Sign Manufacturing Day, so we are incredibly pleased with the results and very thankful to our sponsors and guests,” he said. Sponsors for the event included Brown Bottling Group, Graphic Solutions Group, Principal LED, Reece Supply Company, Sign Faces, Southern Insurance Group, and Wrisco Industries. 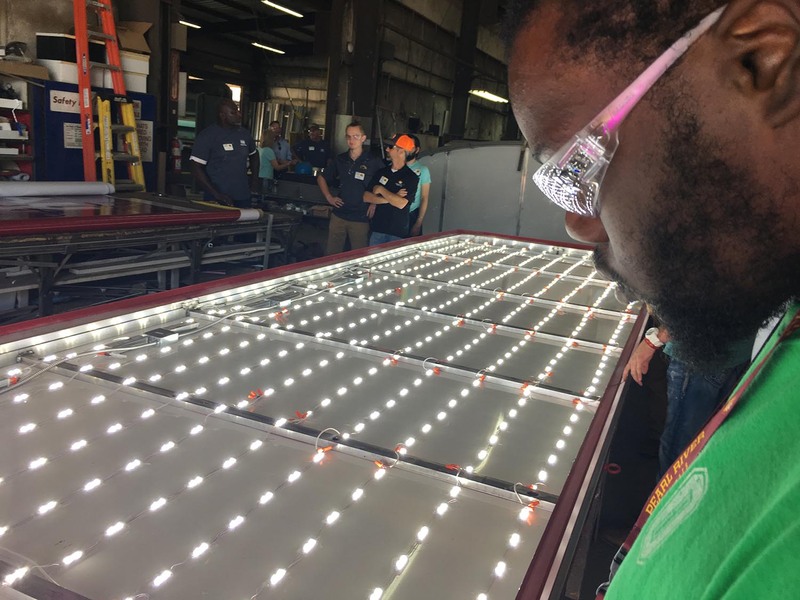 Organized by the International Sign Association, Sign Manufacturing Day was held in conjunction with Manufacturing Day, a national celebration of modern manufacturing hosted by the National Association of Manufacturers. There were more than 2,600 Manufacturing Day events held across the United States. Munn Enterprises, owned by the Munn family of Sumrall, is a manufacturer and installer of signs and related visual communications across the Southeast. The company has more than 70 employees from Hattiesburg and its surrounding six counties. Its 70,000-square-foot manufacturing facility is located on U.S. 49 in Hattiesburg.